Join an eclectic cast each week. Dive into fun, thought-provoking, and engaging conversations on everyday mindfulness – from meditation to spirituality to personal passions to success and failure to relationships and much more. Your host, Holly Duckworth, will feature special guests and the show’s unique cast of over 70 individuals. How teachable are you? Are you able to surrender and to fail in order to gain a different perspective? Chad Hymas is a unique individual who learned to laugh at his mistakes and who turned his experience of paralysis into an opportunity of potential. Chad’s remarkable insights make him one of the most sought-after speakers in the world. Through speaking, Chad (a close friend of host, Mike Domitrz) guides audiences through the process of discovering what they are truly capable of, and how success can be found in making others successful. Subscribe to the Everyday Mindfulness Show. [1:13] A drastic event in Chad’s life changed his belief system. [5:57] Differences can open up doors to friendship. [12:01] To reach a place of potential a person must be teachable. [20:31] Chad reminds himself of what he is grateful for every single day. [24:22] Resources Chad uses for inspiration. Introduction: Welcome to the Everyday Mindfulness Show, the off the cuff exploration of everyday a-ha moments and life experiences. Join a cast of over 70 uniquely brilliant individuals. Each week, Mike Domitrz and an eclectic mix of cast members and special guests will engage in mindful and lively conversations about everything from meditation to spirituality to personal passions to successes and failures to relationship to the stuff that makes up the moments of our daily lives. Let’s get started with your host, author, speaker, provocateur, and a bit of a goofball, Mike Domitrz. Mike Domitrz: Hi, I’m your host, Mike Domitrz, and thrilled to be here with a very special guest and a very close, dear friend of quite some time right now, somebody that I’ve been able to reach out to and we’ve had some wonderful conversations over the years and provided incredible guidance. So happy to have you here. That is Chad Hymas from ChadHymas.com. Thank you, Chad, for joining us. Chad Hymas: Thank you. Good to be here. Mike Domitrz: Absolutely. As you know with this show, you like our guests to be able to share about themselves in your own words, so I’m going to let you start by sharing your mission, what you do in the world, and sort of the story of where you got to where you are today. 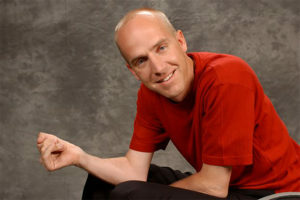 Chad Hymas: My mission is really to influence by sharing a personal message globally on a variety of different topics. Not an expertise in any of them, but just based on experience. By definition, I would probably be considered a guide. I do take a lot of pride in that. By guide, I mean when you think of the term guide, at least in my world, a guide is somebody that wears camouflage, takes somebody up in the mountains and takes them hunting, and gets them close to an elk. I’ve always wanted to do that. My dad has been guiding me since I was a kid up in the mountains, and when I turned the age of 20 I had decided to do that on my own and start an outfitting business. I started construction to be the fuel behind that business so I could build that up so I could make my living that way. Ironically, six years into building that business I broke my neck actually out in the field while building that. Long story short, in the last 17 years since that occurred, that accident 17 years ago rendered me a quadriplegic, which means I’m paralyzed in all four limbs. My hand are dumb and curled, and I have no feeling from the armpits down, but I’ve learned some things. I don’t need to be on a mountain looking for elk to be a guide, nor do I need to wear camouflage to be a guide. Today I have on a hoodie and I’m wearing a ball cap. I also found out that 25,000 acres in the Rockies is a pretty small way of thinking. Like you, I’ve been traveling to several countries and several states within our own country sharing a very, very personal message about leadership and other topics, so my perspective of guide or guidesmanship has changed over the year. Mike Domitrz: Well, I love that, Chad. For anyone listening right now, I’ll give you an idea. Chad is literally one of the most sought after speakers in the world. There are very few, and I mean few as in handful we’re talking numbers wise, of people who do the number of cities, the number of locations, the number of events you do in a year, upwards of well over 200 a year. It’s incredible. You are the ultimate example of guide now. I mean like you said, not the guide path you thought, but now you’re guiding hundreds of thousands a year. Chad’s book when it first came out, I mean it reached a million and a half people without a major publisher. That’s some serious influence and ability to guide and show direction. What, Chad, has been the key for you throughout this journey? Because obviously your life was not planned this way. You never saw it going this direction, and you had such a drastic life incident occur and change everything. What appeared to take away your dreams at the time would just shift your dreams. You would learn down the road that it was a shift. What have been some key takeaways that help along that journey? Chad Hymas: I think you mentioned something very profound. There’s not one key. There are several right answers, a few of them you mentioned just briefly. Number one is to be willing to put myself in a place of potential. A place that is not of potential is locked up or confined in a bedroom. That’s a place of no potential. Another place of no potential is depression. Don’t get me wrong. Everybody goes through that, but you can’t have confidence and depression in the same state of mind. Sometimes that depression will help you get out of that like a jumpstart. What I believe about myself is going to dictate my actions, and my actions will always dictate the results that I get. If I were to believe that most quadriplegics stayed confined to a wheelchair, they don’t get out, they stay in a warm place by a fireplace and watch TV on a bed all day, that’s probably what I would be doing right now. When I’m willing to change my belief system about what I’m able to do, about what I’m able to contribute to society, about the way that I get dressed, change my belief regarding that, change my belief about how I coach my kids, I’ve been able to do every one of those things, just do them differently. That’s a very, very key takeaway is changing what I believe. Maybe a third and final one would be being proactive versus reactive. A prime example of that would be I can sit back in a wheelchair and wait for the kids to ask me to go play soccer with them out in the field. I have very seldom found good results in that, but when I’m practice, when I go out on the soccer field and say, “Hey, do you guys mind if I play soccer even though my legs don’t work?,” I have found great joy, long term joy over that versus waiting to be asked to do something. These are three takeaways that have really helped me to take an experience of paralysis and turn it into a rather unique opportunity, ordinary into extraordinary. Mike Domitrz: You’re the role model of that. I mean you’re the role model of somebody, like you said, somebody might have a perception of restriction and a contained life, and yet you’re the extreme opposite. You’re all over the world. What’s amazing, for anyone listening to this right now, is Chad shared with you that he’s quadriplegic and he has this large organization that he has built. I don’t think I’m revealing anything too revealing. You could have an assistant if you wanted traveling with you to make this maybe an easier journey as far as physically getting you moved around and all of that, but you have chosen to travel this world solo. I don’t mean solo as you don’t have your family at some time, but for the most part you travel by yourself. You have a lot of trust in that people are going to help me in each place I go, in each situation I’m in that a lot of people would think, “Well, jeez, isn’t that risky?” How does that work that for you, no, this is just the way it is? Chad Hymas: When did anybody ever gain something by not risking something? It’s very risky, and you’re right, I do travel alone. Not 90% of the time, 99.9% of the time. The only time I travel with Shondell and the kids is when we’re going on vacation or during spring break, but that is it. I like that risk, and I have found that language is not a barrier. I mean the countries that I’ve traveled to, many times we don’t speak the same language, but people are genuinely very kind hearted. I don’t do that to misuse or abuse anybody. I find it opens up doors of friendships, doors of allowing other people the opportunity to serve and forum to serve them, and to become acquainted. I don’t know what it is, but there’s this instant connection when somebody picks me up and I go to give them a $20 bill for their help and they try and refuse it. Don’t get me wrong. I make them take the money, but I have to say something for them to take it. It usually sounds like this. “This money is not for you. It’s for your kids that are at home that you care about. Grab some ice cream for them. It’s not for you at all.” Then they’ll take it. When they realize that the money’s not because it’s going to take away their blessing for example or something like that, they’ll take that when they realize it’s not for them. I do travel alone. I’m probably not too far off from having to have an assistant travel with me. I’m probably ten years out. I don’t know how far out, but I’m going to do this for as long as I can without having somebody travel with me, because I like it. We’ll call it pride. I take pride in doing that. Chad Hymas: Or why aren’t we asking to help? Chad Hymas: They’re not just asking for help, but asking to help. I mean I see that everywhere I go, just there’s opportunity out there left and right. Mike Domitrz: That’s so brilliant, Chad. I love it, right, because I think people make the mistake I just made. They hear your story and go, “Oh, it’s about asking for help,” but no, no, no. Chad Hymas: No, no, no. Mike Domitrz: It’s both sides. It is both sides of the coin. Mike Domitrz: Because anybody who’s ever met you knows this is true. Individuals who are meeting you along this pathway who you’re going into a hotel and they’re assisting you, you’re going into a plane and they’re assisting you, whatever the circumstances, you are giving back. When someone meets you, their life is different because of your presence. Not because of your situation, because of the presence you bring to the moment, to the situation, to caring about someone. You look people in the eyes. You have a just sincere, incredible, authentic ability to connect. It’s awesome. I have found more of that reciprocating back to me when I go and say, “Hey, can I help you out with that?” Yeah. Then I’ve got you covered as well. Even though physically I can’t go and lift bags of potatoes or do physical things, when I ask the kids, “Hey, do you mind if I help you out and farm in the field?” Most people are thinking, “How would you do that?” Well as long as I’m there, I’m present, my presence, as long as I’m there with them, they think that I’m helping them. I’m out there driving around on my ATV or in the ranch van or the side-by-side vehicle, and I’m there. My presence is there. A lot of service is done just by mere presence. Mike Domitrz: I love that. Chad Hymas: Just by mere presence, just by visible felt leadership. I’m not necessarily out there on the court teaching my kids how to do a layup, but I’m on the sidelines watching their every move. My kids won’t forget that, and I won’t forget it. Chad Hymas: There’s another nugget. You asked what are some of the nuggets. There’s another one. People forget what you say on the platform. They never forget how you make them feel. A question we should ask ourselves as individuals and people listening to this is are people better when we’re around them? Do they feel good? Do we make them feel good about themselves or do we brin them down? Do they feel worse off? Are they not happy? Do my kids perform their best when dad’s on the side of the basketball court watching them paly or are they at their worse? If my wife happiest when I’m at home or does she want me at a Marriott hotel somewhere? I mean I could ask them that question. Sometimes it’s the alternative. In fact, I probably shouldn’t say this. She just walked in the office and she gave a thumbs up when I said Marriott. That tells you, right? Mike Domitrz: Well, I think both of us, obviously our spouses know each other, so there are moments they both have felt that way. There’s no doubt about that. But yet, overall they wish we were home too, and that’s the wonderful part, right? You know, to get to where you are today, Chad, took a great deal of mindfulness at points in your life. You were a very competitive person growing up. You were very competitive in sports and you had a plan of how you were going to build this operation you shared about earlier, the ranch and the guiding for the elks. You were competitive with yourself that you were going to get that done, and then this life accident happens that changes everything. How did your mindset, how did you get to the place of mindfulness? Because you share in your book it was not pretty, that the depression, the ugliness, the feeling of loss that you went from a completely abled person to somebody who was a quadriplegic and you’re sitting there in a place of what could feel like despair at time and moments and days. What were the steps that gave you the mindfulness to have that shift? I know the story, but obviously I want you to be able to share for everyone listening to hear that shift in your words. Chad Hymas: Let’s go back 17 years. In fact, we’re coming upon 17 years next week. We’ll celebrate 17 years when that transpired, when I woke up from a coma. We can make it very, very brief and to the point. When I woke up, my dad gave me the news. He said, “The good news is you’re still with us. The bad news is they can’t fix the spinal cord. You did sever it. Chest muscles, you’ve lost your forearms, your hands. Son, there’s no cure for that. We’ve looked in India. We’ve look in Australia. We’ve looked in Thailand. We’ve looked in Malaysia. There’s just nobody that can fix that. We’ve looked at the Chris Reeves Foundation. There’s just nothing that can be done.” Then he said what if I could be a better contributor, a better father, a better husband, a better guide, a better angler fisherman, contributor to society. I told my dad where he could go. Mike Domitrz: By the way, for anyone listening right now, he’s not saying in a nice way he told his father where he could go. Chad Hymas: Yeah. I used some profanity. I mean I’m being honest with the group. I used some things that I really … well, I used vocabulary that I quite frankly don’t think about and don’t like to use anymore. When my dad heard that, he turned around and walked out of the room. We can stop the podcast right there and just ponder that for a second, on the old man coming in, kind of like a motivational speaker does on a platform, and he’s humbly sharing with an audience member of one some ideas and giving me the what if. This is possible. As an audience member, I am not buying in, and then I just tell him he’s full of garbage, and he walks out. I want you to think about that for a second. He’s walking out for several reasons, but one in particular. You can say he’s walking out because he feels sorry, he’s walking out because he’s going to tear up, he’s walking out because I wasn’t ready to hear it, he’s walking out because him and I are tight, dad and I are tight and how are we going to make this happen. But I think the main reason my dad walked away is he was there to teach me a lesson and give me hope, and you can’t teach somebody something that doesn’t want to be taught, and you can’t give somebody hope that doesn’t want to receive it. The message there is that if we’re going to get to a place of potential and get to a place where most don’t get, we have to be a teachable person. We have to be a teachable people. No matter what our age, no matter what our gender, no matter what our station, I don’t care how much experience people have in life or what your expertise is, if you’re not willing to be teachable, you’re going to be stagnant. You’re going to stay in that place. I was completely comfortable where I was at. I mean I was an adult male, the business was going well, the construction company was doing well, the farm was growing, so I was just like a lot of people. We were growing, and that wasn’t good enough. My dad wanted me to really throw the box outside the window. He came back in and said, “Are you going to be teachable, or are you just going to sit there in that chair like everybody else does?” That was his exact words. I told my dad I didn’t think it was possible for me to do those things, and he said, “If you’re willing to be teachable, I will share with you five things,” and he gave me a few things that have helped me transform. The first one is that teachability, and that is a tough one. That means that you have to surrender. You have to submit yourself. It means you have to be willing to fail. I had to be willing to drop eggs on my lap. I had to be willing to spill applesauce on my chin. I had to be willing to let others feed me. I had to be willing to let the machine breathe for me for a while until I could teach myself to breathe again on my own and get rid of the trach that was in my neck, the ventilator. I had to be willing to let my wife get me dressed. Those are not fun things. Those are things that can be very depressing, discouraging, and could cause feelings of separation, or they can bring people closer together if you learn to laugh a little bit. That’s the next principle is people learn better when they laugh. I learned to laugh at my mistakes a little bit more. I learned to laugh at my body as I watched it transform. Becoming a body or going from a body of having some sort of muscle tone to it … I’m not saying that I was built by any means, but I had some muscle tone, to going to a body where there are more bones showing now than muscle because the muscle atrophies when you’re paralyzed. Hands that used to have good dexterity are now curled in formation because they’re paralyzed. They’ve curled out. I do stretch them from time to time, but I can’t feel that. Really just being submissive and just surrendering. That’s a principle. You’re original question is how did this all transform? Well, here we are 17 years later and I’m still doing the same thing. I’ve been asked this question too, Mike. How long it take? I mean I hear that question all the time. How long did it take before you finally were able to get through all this? Here’s an honest answer. There will never be a day that I can give an answer to that question, because we all go through this thing called life. I still get lonely in hotels, and I still get down sometimes when I think of things I can’t do, but here’s a catch. Here’s the caveat. If I stay caught up on those thoughts, I will stay depressed and I will stay unproductive and I will stay miserable, but the most I focus on what I still can do, the more productive I am. I haven’t gotten through it and I never will, not in this life. I don’t expect anyone … That’s called perfection, and I haven’t met a perfect person yet. I’m looking for progress in myself and in others. I think if we can meet that standard and make that our goal, our bar, I think we’re all going to be better off. I don’t think there’s anything we can do about it. Does that make sense? There’s no magic. Mike Domitrz: Absolutely. Well, and how powerful, right? Everyone, no matter what the situation, we can make progress somehow, some way. Even if it’s just maybe even it’s not physical but our mindset, just to how do I grow my mindset, how do I grow my knowledge, how do I grow love? Chad Hymas: There you go. Mike Domitrz: How do I grow love for other people, for my spouse, for my children? How about this one? I think this one you understand fully. How do I love myself given who I see? That’s true of all of us when we look in the mirror. How do I love myself despite my imperfections? Maybe even more because of them? Like how do I love them? Chad Hymas: I think one thing that’s helped me is the more that I help other love themselves, the more I love myself. The more I help my boys and my children love themselves and they way that they are and the gifts that they’ve been given, the more I’ve come to love myself. I have found great reward in the Stephen Covey quote that says in order for you to get everything you want out of life, find someone else that has a need and help them solve that first. That has been very profound in my life. That’s not my quote. That’s Stephen Covey. Very few people act on that. More people need to act on that, and they’ll find the same result that I have in my life. Chad Hymas: Very much so. Mike Domitrz: That I serve as a way of life versus I serve to get. It’s such a dramatic difference. Chad Hymas: No, for sure. I don’t think I could agree with you more on that. I think that the more we give, the more we get back in return, but we don’t do it for that. Chad Hymas: You get caught up in that, then that becomes egotistical. You become narcissistic, and then it becomes an arrogance kind of a countenance, and people can see that. They can tell that. Without you even saying a word, they can see that. Chad Hymas: They see a place of sincerity and you willing to give of your time, now we’re talking about people that really understand. Mike Domitrz: Yeah. It’s huge. Speaking of that, what would be for you on a daily basis, is there a routine that helps you be a success? Mike Domitrz: Not only successful, but as productive, as fulfilled as you are? I mean you’ve built an incredible organization. Because for anyone listening right now, when I said that 17 years ago you were this really competitive person, let me be very clear. He is as competitive. I didn’t know Chad at that time when things happened, but I know how competitive you are today. You are very competitive. Even though people think, “Oh, he’s built to serve and all. That must mean he gave up all of that, and he doesn’t have a competitive bone,” no. Not even close to that. I think that’s a fair statement to make, right? You have a competitive bone in you that is very strong. Chad Hymas: Put me on basketball court with my kids. You watch. Mike Domitrz: That’s right. That’s right. How do you balance it all? How do you integrate it all? Because you do implement. I mean somebody gives you an idea, you’re not just going to use it, Chad. You’re going to take the idea and make it 10 times bigger than the person who shared it with you. How do you do that in a way that’s mindful? You take care of the people around you. You take care of your team and the organization you’ve built. How do you do that? How are you mindful of that on an ongoing basis? Chad Hymas: Well, you’re only as soon as the people you surround yourself with. You’ve heard that, and you’ve got to take care of those people. I think also go back to this piece that dad taught me. Again, he said if you’re going to be successful, you must focus on other people’s successes, their needs, their fears, and their victories, and helping them solve that. As I’ve done that, I have found myself becoming what I am today. Then you asked this question. You asked me about a routine. There is a routine. Each morning when I wake up, I need to take … and I’m very careful with this time. It’s not a massive amount of time. 10 minutes is all I’m asking you to do, 10 minutes as soon as you wake up, because if you don’t do it you’re probably … if you don’t do that first 10 minutes, you probably won’t do it at all, 10 minutes for yourself to just find out what are you grateful for that day. I didn’t say you had to give a devotional or a prayer or anything. List those things out either on a sheet of paper or your mind, but what are you grateful for today. Some days it’s going to be the same thing, but you should look for something different in each and every day. Are you grateful for the snow that came down today? Or maybe it doesn’t snow tomorrow. Are you grateful and why are you grateful for the snow? Just 10 minutes of your time. That’s not a lot of time. That is a big part of my day every single day when I wake up is that first 10 minutes when I wake up, how can I show my gratitude and what am I grateful for? That has been profound. Then I need to do something for myself. Usually that’s getting dressed, but for others it’s exercise. Getting dressed for me is exercise. For some reason, it just gets me pumping, the blood going. Even though I can’t feel it and feel the blood in my hands and feel the warmth in my hands, I need to get energized. For a lot of people, it’s going to the gym or it’s going on a run or going on a walk and burning some calories or whatever that might be. For me, it’s getting my shoes on. It’s getting the jeans on. Not in that order. Jeans usually come before shoes. It’s getting dressed. That kind of gets the blood going. I think that’s powerful for people to get up and get their day started, but before you do that, take 10 minutes to yourself to find … those are two small, simple routine things that I do every single day that if we don’t think about it, then it just becomes mundane. People most the time get up and get dressed and they just start their day. Well, do it with some energy. I find a lot of positivity. I find that it’s almost like taking a drug that just gives you energy. I prefer to be drug free. I’m not saying that because I’m against prescriptions and medications. For me, just I’ve lost some friends that have had medications backfire on them that are in my circumstance, and I don’t want that to happen to me. I’ve learned lessons from them and learned lessons from others. Those are some routines that I’ve put in place in my life. Mike Domitrz: You brought up that you learn. You’re a huge learner. You love to learn. For you, what’s your greatest learning source? Do you listen to podcasts? Is it books for you? Mike Domitrz: Love it. Love it. Are there certain authors or books, maybe one, two, or three, that have just had a massive impact on the journey? Chad Hymas: I’ve got one sitting right here that I’m just reading, and I just got this, just opened it up. I don’t even have the author’s name, but it’s Turn the Ship Around. It’s about turning your life around, going from ordinary or even going from down and depressed, taking the mantle and turning that sucker, turning your life. Taking the helm, taking your life by the helm is what the books about, but it’s called Turn the Ship Around. Mike Domitrz: Ar, Turn the Ship Around. I love it. You’re reading it right now? Chad Hymas: Somebody heard me speak and said, “Chad, you just quoted that book verbatim.” I never read it before. I’m reading it now so that I can actually say that I can quote it verbatim. Mike Domitrz: Isn’t it funny when people do that? “Hey, you must’ve read that book.” No, that just was something I thought of or I’ve heard it before, right? We’re not having too many original thoughts. It’s stuff we’ve learned and we’re sharing with others. That’s what you do as a guide. It’s not that you’re the creator of the idea. It’s that you share the idea. Chad Hymas: That’s a good book. Prior to this, Art Berg’s book, The Impossible Just Takes a Little Longer. That’s a great book. I find myself reading the same books over and over and over again. There’s so many books by so many authors that are so great, it can be overwhelming. I would just ask somebody to pick a book and read it and finish it. Aspire by Kevin Hall is a great book. Chad Hymas: Right, away from the book. Mike Domitrz: It explores and has new discoveries and opportunity for growth and a-ha moments. Chad Hymas: That’s right. That’s right. Very true, very true. Mike Domitrz: Well, Chad. You know how much I love you. I am so thrilled that everyone listening right now gets to learn from you and exposed to the energy you share with the world. You’re the ultimate definition of a guide. I want to thank you for joining us. For everyone out there listening, if you’re going, “Hey, how do I find this guy? Because he is amazing,” you’re correct. He is. You can find him on EverydayMindfulnessShow.com. We’ll have a link to his website, which is ChadHymas.com. Makes it easy, but we’ll have a link. We’ll have all that information. For everyone listening right now, I hope you check it out. Until next time, may yeah enjoy everyday mindfulness in your life. Three quick reminders. One, please subscribe to the Everyday Mindfulness Show on iTunes. Already subscribed? Then encourage others to join us by inviting them to subscribe to the show. Two, while on iTunes, download all the latest episodes. Three, reviews help more people find out about the show. Would you please go into iTunes and write a review? Doing so helps spread the mission of the show. Thanks. Thank You: We appreciate you being a part of our vibrant, oftentimes silly, and always vulnerable community. If you have an idea, a thought, want to sponsor the show, or just want to say hi, send us an email at listen@EverydayMindfulnessShow.com, and check us out at EverydayMindfulnessShow.com. Have a joyful, mindful week. The Wall Street Journal calls Chad Hymas “one of the 10 most inspirational people in the world!” Chad inspires, motivates, and moves audiences, creating an experience that touches hearts for a lifetime. He is one of the youngest ever to receive the Council Of Peers Award For Excellence (CPAE) and to be inducted into the prestigious National Speaker Hall Of Fame. In 2001, at the age of 27, Chad’s life changed in an instant when a 2,000-pound bale of hay shattered his neck leaving him a quadriplegic. But Chad’s dreams were not paralyzed that day — he became an example of what is possible. We promise not to spam you. When we contact you, it will be to let you know about a new show, a mindful tip, treasure or something of value for living an everyday mindful life. 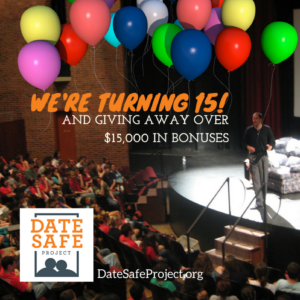 Get over $15K in bonuses for your organization, college campus or military installation!